It is a documentation of my installation. This work tries to break viewers usual perception on space and game through disorientation and confusion by a virtual environment which is formed by a dynamic maze appearing in three different screens being positioned in U-shape. Physical perception is also experimented by using a special walkthrough device (helmet). There are two spatial systems formed – virtual and physical. Each screen represents an individual virtual space and therefore three virtual spaces together form a spatial system. 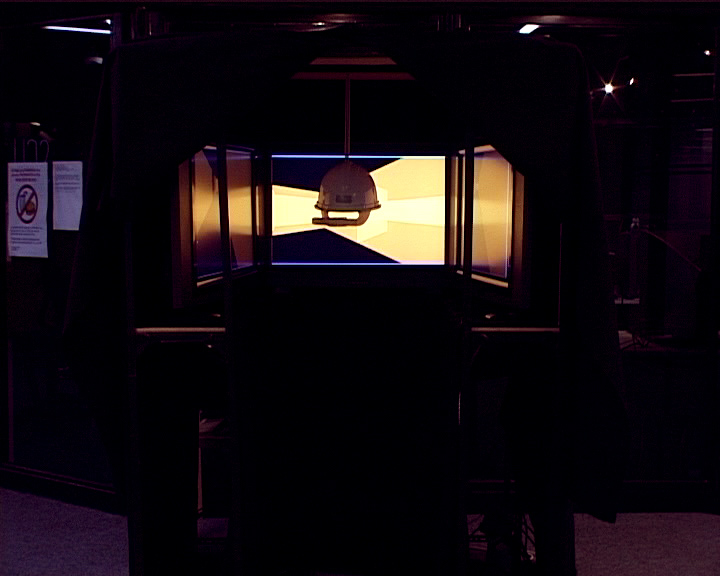 The different positions of screens form another physical spatial system to the viewer as well. The color of this work is intended to be reduced and simplified in order to minimize the effect of viewers’ memory bringing to perceive this piece. The virtual spaces that represented in the three screens are intended not to be synchronized. The centre screen is a dynamic maze, the partition of which will be reset in a certain period of time and the left and right screens are long corridor only. The purpose is to make the viewer to confuse by lying somewhere between can and cannot realize the relationship between those screens. The design of the virtual space inside the three screens is similar in order to hold a spatial relationship in viewers mind and confuse them to expect the spaces are synchronized. Viewers not only perceive the maze/space visually, but physically. Everyone has to learn to walk by their head before they manipulate to walk through inside the maze. They have to try by experiment for the movement of the head because they do not know the helmet connected with a joystick on the top. As a result, some viewers break the intended usage of the helmet by using their hand to move it.